There's a trend that's been brewing among royal ladies. I've been loathe to declare it as such, but after today...I think I have to. And I will do so while banging my head on my desk, because this trend is the new bane of my existence. The SHOOTIE. I'm sorry to go all caps-locky on you, but I think it's warranted. A ridiculous word, a ridiculous look. Why, please tell me why, would you voluntarily cut your legs off? Can't we all unite in the pursuit of a nice long leg line? Crown Princess Victoria's one and only appearance that came close to making my Top 10 Worst of 2010 list, and it's all because of the SHOOTIE. Letizia's a fan. I have to say, if this was going to look good on anyone, it would probably be Letizia based on the wee size of her legs, but no. You will notice how she wears them with matching tights, thus negating the whole SHOOTIE effect in the first place, though that little trick still doesn't erase the mistake of that cherry red number. I saw this today on Laurentien, and my concern increased. That's a distracting dress (I mean, what's going on around the shoulders? ), but you still can't hide the SHOOTIES. You know how these Dutch princesses are. This is bound to be only the tip of the SHOOTIE iceberg. The Estonian state visit to Sweden has brought a whole host of interesting sartorial appearances, courtesy of the Estonian First Lady there. Wrestle your attention away from the headgear for a moment. I know, it's impossible (oh LORD is it ever impossible), but move your eyes in a downward direction. Before you have a heart attack, know that Queen Silvia's not pulling a Letizia here, that's just static cling wreaking havoc on her skirt. She saved her Letizia move for the feet. A double SHOOTIE appearance. I'm still trying to recover from the horror. If this phenomenon has made it's way from wannabe fashionable princesses to the realm of queens, I'm afraid we have a real problem on our hands. I'm thinking of starting a petition. 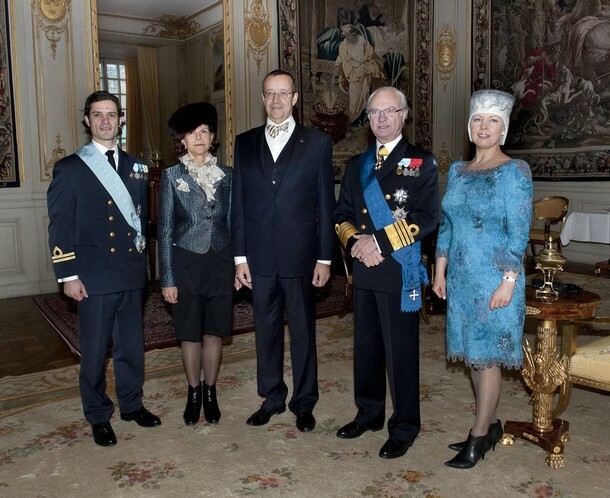 (I'm also thinking of starting a Worst of 2011 list for those accompanying royals based solely on the sartorial wonder that is the Estonian First Lady, but that's another story.) Who's with me?